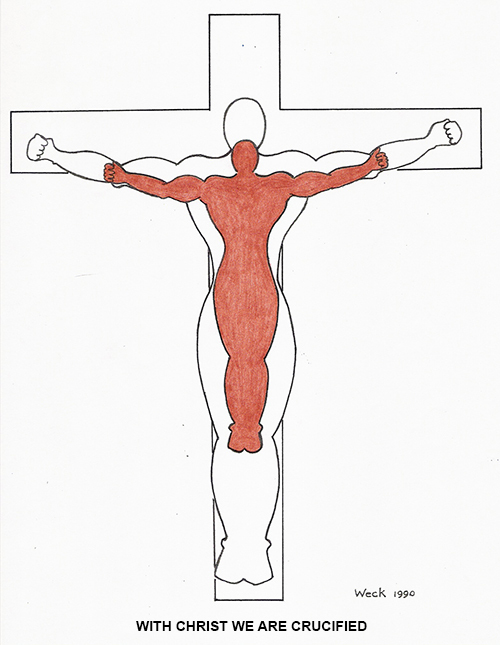 “I am crucified with Christ: nevertheless I live…” (Gal. 2:20). “Know ye not, that so many of us as were baptized into Jesus Christ were baptized into his death? Therefore we are buried with him by baptism into death: that like as Christ was raised up from the dead by the glory of the Father, even so we also should walk in newness of life” (Rom.6:3-4). The baptism which is spoken of in Rom.6:3-4 is NOT referring to water baptism! There are several baptisms mentioned in the Bible, some physical and some spiritual, consider, (Acts 1:5). It is impossible for sinners to enter the Body of Christ by being immersed in water. Sin is an internal problem, a problem of the heart. No amount of water applied to the exterior can change the interior. Believers water baptism is symbolic; a picture of a spiritual reality, an outward manifestation of an inward change. The second a sinner acknowledges his sin, repents and accepts Christ as Saviour, he is supernaturally placed “in Christ”. This is a spiritual operation accomplished by the Holy Spirit, “For by one Spirit are we all baptized into one body…” (1 Cor.12:13). Most believers readily understand that they have been resurrected into new life by trusting Christ for salvation (2 Cor.5:17)…yet very few seem to fully understand how that was accomplished; nor do they comprehend that resurrection into a new life is only one part of a three-part reality. Remember, baptism has three elements; death, burial, and resurrection. 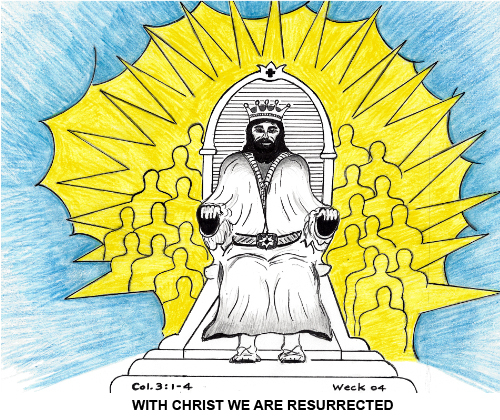 All born again believers, are in fact, not only resurrected into a new life (made spiritually alive) in Christ but also baptized (or placed into) HIS DEATH at Calvary. 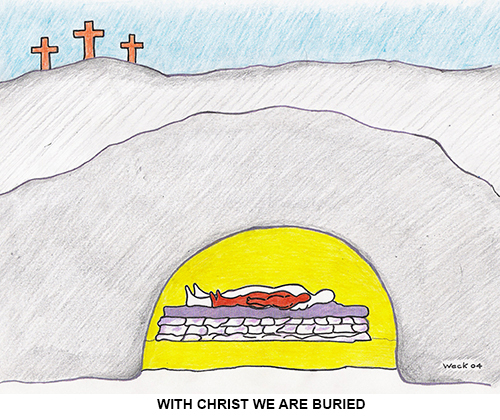 Thereby uniting us with His death, burial, and resurrection, so that all He experienced on the cross is imputed (credited) to us. 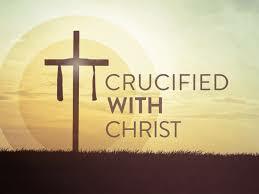 In the eyes of God, the body of flesh has been crucified with Christ (co-crucifixion) and “ye are dead, and your life is hid with Christ in God. When Christ, who is our life, shall appear, then shall ye also appear with him in glory.” (Col. 3:3-4). “I am crucified with Christ: nevertheless I live; yet not I, but Christ liveth in me: and the life which I now live in the flesh I live by the faith of the Son of God, who loved me, and gave himself for me.” (Gal.2:20). “For by one Spirit are we all baptized into one body, whether we be Jews or Gentiles, whether we be bond or free; and have been all made to drink into one Spirit” (1 Cor.12:13). In Romans chapter 6 the apostle Paul provides a detailed explanation of this vital doctrine, revealing the inner workings and subjective, practical experience of co-crucifixion. In this key chapter of Scripture, we are exhorted to, “reckon [by faith consider it true] ye also yourselves to be dead indeed unto sin, but alive unto God through Jesus Christ our Lord.” (Rom.6:11) [Emphasis mine]. By FAITH in the power and authority of God’s word, acknowledge the reality that your “old man” has indeed, been crucified with Christ on Calvary (Rom. 6:6) and the “new man” (“Christ in you, the hope of glory…” Col.1:27) is ready and able to supply the necessary power to overcome temptation and sin. When yielded to He “…is able to do exceeding abundantly above all that we ask or think, according to the power that worketh in us.” (Eph.3:20). Faith is the Catalyst which Transforms Knowledge into Experience. We were saved by FAITH when we believed what God’s Word said about us (sinners) and His Son (Saviour); as a result, a supernatural event occurred…new life was imparted. The same is true regarding the process of sanctification; when we by FAITH believe what God’s Word says about us (“dead indeed unto sin, but alive unto God through Jesus Christ our Lord.”) a second supernatural change takes place; not a one-time event but a life-long process which brings into operation a powerful counterbalance to the “flesh”; which enables us to “walk in newness of life” (Rom.6:4) also (Eph.5:8). “Spiritual understanding” (Col.1:9) is not attained by the wisdom of the natural mind; knowledge must be quickened by the power of the Holy Spirit; intellect, logic, and reasoning are of no avail. “I die daily…” (1 Cor. 15:31). “Always bearing about in the body the dying of the Lord Jesus, that the life also of Jesus might be made manifest in our body.” (2 Cor.4:10). Sanctification is incremental, involving a daily dying of self, a process of surrender, in which the outward man gradually dies; making us “conformable unto his death”, while the inward man is renewed day by day. (2 Cor.4:16). “He must increase, but I must decrease.” (John 3:30). Surrender is the currency of freedom and spiritual power; submission which unleashes “the power that worketh in us.” Faith isn’t faith until it has been tested and power isn’t power until it has been exercised. The most important fact to comprehend is that Jesus Christ HIMSELF actually lives inside of you in the person of the Holy Spirit, “Christ liveth in me…”(Gal.2:20). Compare, (Gal.4:6, Rom.8:9 & Phil.1:19) “the Spirit of Jesus Christ” is one of the titles of God the Holy Spirit. An awareness of His literal presence changes everything. If you have a GENUINE DESIRE to follow the Lord and live above sin, God has made it quite possible to do so. For the WILLING HEART, Romans 6:11-16 details the pathway to freedom.“What shall we say then? Shall we continue in sin, that grace may abound? God forbid. How shall we, that are death to sin, live any longer therein?” (Rom.6:1-2). Apart from the Holy Spirit, there is no life. We are dead in the sense that we are unable to accomplish anything of eternal worth in and of ourselves. This is what the apostle Paul meant when He said, “by the grace of God I am what I am; and his grace which was bestowed upon me was not in vain; but I laboured more abundantly then they all: yet not I, but the grace of God which was in me.” (1 Cor.15:10). The command is, not only to intellectually acknowledge but to live BY FAITH what Christ has accomplished for us through His death, burial and resurrection, “…yield yourselves unto God, as those that are alive from the dead, and your members as instruments of righteousness unto God” (Rom. 6:13). When the positional reality (dead in Christ) becomes a practical experience, then and only then, are we said to be walking in the Spirit. “Therefore we are buried with him by baptism into death: that like as Christ was raised up from the dead by the glory of the Father, even so we also should walk in newness of life” (Rom.6:4). Heart Attitude, the Key to Comprehension. Spiritual development depends more upon the attitude of heart than intellectual understanding. Knowledge of the truth of co-crucifixion, or any other doctrine for that matter, doesn’t necessarily make it real in our lives. We must, by faith, wholeheartedly seek the practical reality of it as well. Spirituality isn’t determined by how much truth we know but rather by how much truth we live! It is essential that we, by FAITH, choose to live what Christ has achieved for us, only then will it become our life experience. Doctrine isn’t merely meant to be a transfer of spiritual principles from one mind to another…doctrine is designed to renew the mind and change the heart! In order to comprehend spiritual truth, you must first have a heart for it: “Wherefore is there a price in the hand of a fool to get wisdom, seeing he hath no heart to it? (Prov.17:16); that is, a humble heart that’s willing to be changed by truth, (Ex.35:5, 21, 22, 29). The obedience heart which is rooted in love and gratitude for the Saviour, “We love him, because he first loved us.” (1 John 4:19). “But God be thanked, that ye were the servants of sin, but ye have obeyed from the heart that form of doctrine which was delivered you. Being then made free from sin, ye became the servants of righteousness.” (Rom.6:17-18). “…that form of doctrine which was delivered you” the form of doctrine referred to in this verse is a complete understanding of the doctrine of salvation; including the life-changing details of co-crucifixion. Notice verse 18, “Being then made free from sin…” As we obey from the heart, freedom from sin becomes a practical reality. “Consider what I say; and the Lord give thee understanding in all things” (2 Tim. 2:7).